Even though Medaglia d’Oro’s fee has been reduced to $200,000 from last year’s $250,000, this son of El Prado still justifiably ranks among America’s highest-priced stallions. After all, he had eight yearlings sell for $1 million or more at last year’s sales and, in 2017, he notched up the remarkable total of seven individual Grade I winners in the U.S. That’s very good going for a horse who was priced no higher than $35,000 when he made his stud debut at Hill ‘n’ Dale in 2005. With Medaglia d’Oro now 20, the search is on for his successor. Perhaps the search hasn’t been made any easier by the fact that fillies such as Rachel Alexandra, Songbird, Elate, Plum Pretty, Champagne d’Oro, Gabby’s Golden Gal, Marketing Mix and New Money Honey account for 12 of his 19 Northern Hemisphere Grade I winners. That said, there are sons of Medaglia d’Oro at several of Kentucky’s foremost stallion stations. While Coolmore hasn’t shuttled the champion Australian 2-year-old Vancouver for a third season at Ashford, Darley has travelled Astern, another of Medaglia d’Oro’s best Australian sons, for a second season in Kentucky. Then there’s the newly retired Bolt d’Oro at Spendthrift, with Fast Anna at Three Chimneys, Mshawish is at Taylor Made and both Atreides and Violence at Hill ‘n’ Dale. A lot has been expected of Violence ever since he attracted a $600,000 bid from Steve Marshall’s Black Rock Stables at the yearling sales of 2011, when his price was bettered by only one other son of Medaglia d’Oro. That other son, the $1.2-million Superfection, never raced and was gelded, but Violence has proved to be worth every cent. A debut victory over seven furlongs at Saratoga earned Violence an immediate step up to Grade II company in the Nashua S. at Aqueduct. Victory was widely expected to go to Darwin, another Pletcher-trained colt, but it was Violence who overcame his greenness to score by two lengths. Although Pletcher suggested that Violence would not be seen again until the winter circuit moved on to Gulfstream, the colt was given one more juvenile start, six weeks later on the opposite coast, in the GI CashCall Futurity on Hollywood Park’s Pro-Ride surface. Despite the presence in the field of He’s Had Enough, who had failed by only a head to wear down Shanghai Bobby in the GI Breeders’ Cup Juvenile, it was Violence who started a short-priced favorite. He justified the confidence, maintaining his unbeaten record by more than a length, with the future GI Preakness S. winner Oxbox fourth and He’s Had Enough fifth. 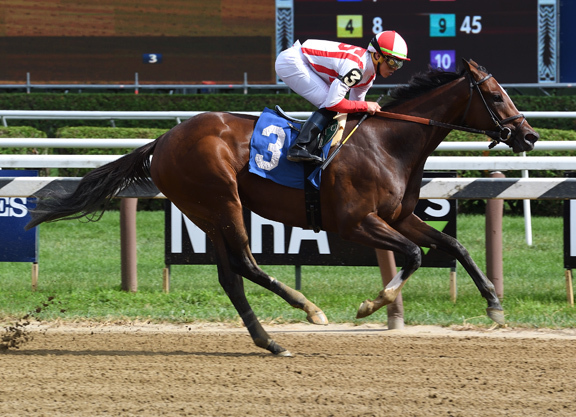 The compilers of the Experimental Free Handicap shared Castellano’s enthusiasm, awarding Violence 123 pounds, which put him joint-second with He’s Had Enough among the males, three pounds below the unbeaten Shanghai Bobby. The GII Fountain of Youth S. was the next stop for Violence and he started odds-on, even though the race’s conditions meant he was set to give six pounds to all eight of his rivals. He nearly proved up to the task, but at the wire he was a half-length adrift of a progressive colt called Orb. While Orb went on to decisive Grade I victories in the Florida Derby and Kentucky Derby, Violence’s career ended in the Fountain of Youth. He was found to have suffered a fracture to a sesamoid. “#1 Second Crop Sire by Cumulative SWs and SHs with 5 SWs and 8 SHs. His initial fee of $15,000 in 2014 ensured that Violence would be very attractive to mare owners. In addition to possessing good looks and a fashionable sire, he offered Grade I-winning juvenile form and a female line which featured the champion older female Sky Beauty as his third dam, the dual Grade I winner Maplejinsky as his fourth dam and Mr. Prospector’s champion sprinter Gold Beauty as his fifth dam. Sure enough, mares flocked to Violence, with nearly 700 of them visiting him during the four years he was priced at $15,000. He attracted another 214 in 2018, when his fee was $25,000. He now holds first place on the TDN‘s list of Leading Third-Crop Sires, both by cumulative earnings and for the current year. The cumulative table credits him with 105 winners, of which 13 have won black-type events and three are graded stakes winners. The latest of those graded winners is Feedback, who landed the GIII Forward Gal S. over seven furlongs. Her predecessors are Cosmic Burst (GIII Honeybee S.) and Talk Veuve To Me (GIII Indian Oaks). It is significant, in view of Medaglia d’Oro’s record, that all three of Violence’s graded winners are fillies, as is Vibrance, who–like the Acorn S. second Talk Veuve To Me–has been runner-up at Grade I level. I tend to think this is simply coincidence, as there are plenty of colts among his 22 black-type horses. Perhaps because his progeny have often sold for substantial amounts, I find myself wishing that he had a few more top-level performers to his credit. However, it’s important to remember that all of Violence’s racing-aged progeny were sired at $15,000 and that his second-crop 3-year-olds haven’t had many opportunities. His ‘TDN Rising Star’ Feedback was racing for only the second time when she landed the Forward Gal S.
Feedback’s pedigree suggests she may be capable of shining at a higher level. Her dam, the Grade III-placed Honest Answer, is a half-sister to I Ain’t Bluffing, a Pine Bluff filly who enjoyed Grade I success in California over seven furlongs at three (La Brea S.) and 1 1/16 miles at four (Milady H.). Another of Honest Answer’s half-sisters, Sweet As Honey, produced Borrego, a high-class 1 1/4-mile winner to a mating with Medaglia d’Oro’s sire El Prado.